Organic eating has gone mainstream. Responding to consumer demand, supermarkets now feature centrally placed organic produce sections. Over the past decade, the organic food industry has increased at 20 percent per year. What drives this growing support for organic food? Not surprisingly, savvy consumers figure that if a whiff of pesticides can kill bugs dead, these chemicals aren’t going to do us a whole lot of good. After all, our cells respond to poisons in the same general manner. And toxic herbicides aren’t that appealing either, even if there’s just a trace left at harvest time. Yet to put things in perspective, the use of these substances for agricultural purposes has been a common practice for just half a century. Prior to the 1950’s, organic farming was the normal system of food production. The pesticide/herbicide industries and the chemical warfare industry grew together as siblings; the research that supports these fields has much in common. Many pesticides were registered long before extensive studies established links to cancer and other diseases and the sometimes tragic effects on farm workers became known. The list of permitted chemicals varies markedly from country to country. According to a 1993 National Academy of Sciences study “Pesticides in the Diets of Infants and Children”, pesticide regulation is outdated and flawed. The risk assessment that has been done is based on adult consumption of one pesticide at a time or on animal studies. Yet the concentration of chemicals in the body of a rapidly growing child is likely to create a different and possibly higher risk. Furthermore, we have no idea of the possible effects of ingestion and interaction of a mixture of dozens of these substances over a lifetime. Are there further advantages to choosing organic produce? Consumers report that it tastes better. What factors contribute to the development of a flavourful tomato or a luscious strawberry? Sunlight, clean water, and soil with the full spectrum of minerals and essential nutrients are high on the list. Organic farmers keep their soils balanced and well fed through proper tillage, crop rotations and the use of beneficial pests and predators. A 2004 study showed organic tomatoes to have more vitamin C and protective substances known as carotenoids. Canadians also like the fact that organic foods are not genetically modified. Eating low on the food chain, we avoid the toxins that accumulate in animal fats. An easy way to boost your intake of organic produce is to arrange for weekly delivery. You can select the colourful contents of your box from the comfort of your home; produce quality is excellent. Choose from seven services in the Lower Mainland: Ladybug Organics; SPUD; Organics at Home; Green Earth; Blue Moon; Squeez; and Organics Delivery BC. Farm markets are also great places to get organic produce in season. On a warm spring day, explore the possibilities at Yaletown, Granville Island, or Trout Lake. For a full listing of locations and services, check out the Farm Folk City Folk web-site at www.ffcf.bc.ca. Kale and collards are great calcium sources, but we may be at a loss about how to prepare them. 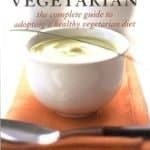 Here’s a solution from “The New Becoming Vegetarian” (US title), “Becoming Vegetarian” (Canadian title), by Melina and Davis that is so delicious that it’s practically addictive. A 3/4-cup serving provides more well absorbed calcium than a cup of milk. At our March 5 Langley workshop “Living Without Dairy: Great Food, Smart Nutrition”, we’ll make many such recipes (604-882-9331 or 604-888-8325). Remove stems from kale or collards; chop in strips about 1 inch wide. Place greens in a steamer, cook until soft, and drain well. In preheated frying pan, combine oil, garlic, cumin and paprika; cook over medium heat for 1 to 2 minutes, without letting garlic get too brown. Add parsley, steamed greens and tamari; stir to distribute seasonings. Serve with wedges of fresh lemon or sprinkled lemon juice. Makes 3 cups (4 servings).